fivetwo beauty: May 2013 Ipsy/ MyGlam Bag: First Impression+ UPDATE! May 2013 Ipsy/ MyGlam Bag: First Impression+ UPDATE! is Ipsy glambags theme for May. I will keep my first impression short (and I will try to be sweet) since I got tons of pictures to show you! First off this bag. This Chevron pattern was pretty shocking after getting tons of plain boring bags before. Love the pattern, not so much the color combo. I wish it was plain teal in a different fabric material. This one is the usual material they have been using with the past bags and it just attracts dog hair because of the static it makes. Anyways, not my favorite bag, for short! "Yes! We have started personalizing your Glam Bag products using a new personalization tool called ipsyMatch! We have invented a sophisticated system that uses the results from your personal profile, your Beauty Quiz, and your activity on ipsy.com to consistently create a Glam Bag filled with the best beauty picks just for you month after month!" Now more up-close look with the products! 1- NuMe Finishing Serum (.33oz/10ml): The card by the way has a discount code in the back, which I am planning to use some day so apologies for not sharing it. I am not sure if it's a one time use code and personalize for every Ipsy member. It does say in the fine print the code is "Limit one per person, one time use only, one per transaction. Cannot be combined with any other offer, deal or promotion." But click on the product name above and it should send you to a link to a 60%off discount code you can use now (which expires on 10/31/13)! Now off to the product, well I have not tried it out but it claims to tame fly aways and frizz; give you glossy shiny hair and treat split ends. Can't wait to try this out on rainy days and very humid days when my hair do get frizzy and all my baby hair is just all over the place! UPDATE 6/11/13: This gave my hair such awesome shine after I flat ironed my hair. I have been putting this on after air drying my hair 60% and it did help with the frizziness. It didn't help much with the fly aways just with air dried hair. I say blow dry straight or flat iron + this serum will definitely do the trick! 2- Pacifica Roll-on Perfume in Island Vanilla (.33oz/ 10ml): I just had to take a picture of the box it came in too since I just love the pattern and the color combo in it! I don't have a big collection of perfume but I have never bought any perfume that has vanilla scent to it. "island vanilla: natural, pure grain alcohol and pacifica’s signature perfume blends with essential and natural oils. made without phthalates, parabens, mineral oils, gmo, propylene glycol, and artificial color. no animal testing. 100% vegan and gluten-free." I put this on today, and it's something I can get used to. It's not overpowering smell of sweet vanilla at all. Few hours later, the scent is more subtle. All in all, I like citrus scents during the Spring/ Summer season and this is something I would wear during the cold months. UPDATE 6/11/13: I love wearing this when it is muggy and rainy out. Helps to make the humid air smell good. This is not an overwhelming scent at all and I love that about Pacifica scents. "Island Vanilla: Inspired by the unique magic of Tahitian vanilla, this sensual blend sets sweet and sultry vanilla absolute, with honey-jasmine notes and a touch of fruitiness, against a deep and beautiful base of tea." 3- Zoya Nail Polish in Piaf (15ml/ 0.5 fl oz): Never owned Zoya before this so thank you so much Ipsy! I have been wanting to try this brand out, but I just keep getting so many nail polishes in my Ipsy glambags that I have no reason to buy at all! So I got this pastel yellow that looks like it has shimmer in it just by looking at the bottle. Watch out for an update picture later for a Nail of the Day (#notd) shot with this polish! UPDATE 6/11/13: Check out my NOTD with this polish on my Instagram, here. This polish has glitter in it and it is just a pain taking glitter polishes off and this one is no exception. I do love using this color for nail art instead of coloring all my nails just with this color. 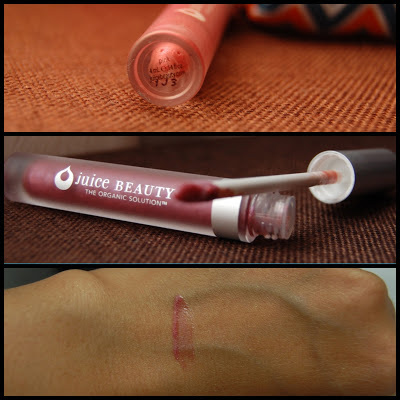 4- Juice Beauty Reflecting Gloss: I love the scent on this gloss! It reminds me of orange creamsicle! I put this on today on bare lips and since I have pretty dark pigmented lips, it only gave me shiny gloss on but no color can be seen. I have to try it on top of lipstick and see how this looks. Consistency wise, it's definitely not sticky! And definitely gives my lips lots of shine! UPDATE 6/11/13: I have been using this as a lip balm at home since it is just so moisturizing and not sticky on my lips! This to me is more of like a liquid lip balm! It do give my lips that shine but no color at all so I just keep it at home and use my other more pigmented lip glosses when I'm out. "The combination of antioxidant-rich berries, minerals and sweet agave will wrap your lips in radiant color." That's with just gloss. Tons of shine but no color. 5- Yaby Concealer in Vanilla (refill; 3.50 grams): This pan is dime size; a tad bigger than the eye shadow pans that we received from March Ipsy Glambag. I have not opened this one to try, since this is in Vanilla and pretty much will just look white on my skin! Pretty disappointed how they got this wrong when I have Tan on my ipsyMatch profile! Not really sure what to do with this one yet. Got suggestions? UPDATE: Check out my more in-depth blog post, here. I love this concealer, it goes on smooth and brightens my eye area. Definitely great for highlighting! UPDATE 6/11/13: I have not used this shadow yet since that glitter scares me! I still have to play with this and mix and match it with my other shadows. All in all, it's an ok bag for me. I am not sure what to do with the concealer to make it work for now. A girl can never have enough nail polish and I'm excited to play with this yellow color! I can't have too many roll-on perfumes either, especially a scent I won't buy myself! A lip gloss is always welcome in my make-up collection! And a hair product is always great to have to stock up on when the weather is not as cooperative as my dvr =P And of course a free full sized UD eye shadow! This just paid the bag for me! It's a challenging color but it's great to have. Thanks again Ipsy! *This is my personal referral link or what they call ipsyPoints, so they know I referred you! And of course, for every two referrals Ipsy sends a gift to that member! Another way of them saying "thank you!" to their members! Once you're a member though, you get your own referral link and you can give that to your friends to join and get the free gift as well! Looks awesome! I signed up for ipsy a few days ago. thanks and Welcome Ipster! :) hit me up on my Ipsy profile so I can check out yours! That's nice of them that they throw in a full sized eye shadow! I love the shade of the gloss even though it's doesn't have much Colour. I know right?! Check out their FB page for their giveaways, their prizes are pretty awesome too! Wow, Stargazer looks like it is going to be a gorgeous color! i shared my video last week on the blog. you can try going on ipsy and see if anyone will trade shades or products with you. i love what i got this month! I contacted Ipsy and suggested a link to their swap forum and a link to a Look on their Ipsy site, which was pretty helpful! The color actually works as a great highlighter for me - blog post on it coming soon! 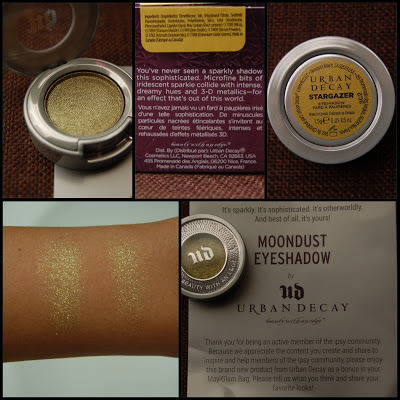 Watched your video btw and I like what you got too =) Ipsy has been pretty great so far!